This Saturday, the Texas Longhorns are looking to do something they haven’t done since 2002… Leave Manhattan, Kan. with a win. The last time UT beat Kansas State on the road, Chris Simms was the quarterback for Texas and Dusty Magnum kicked a game-winning field goal to give Texas a 17-14 win on October 19, 2002. To put things into perspective, LeBron James was a senior in high school the last time the Longhorns beat K State on the road. The Longhorns (3-4, 2-2) are coming off a thrilling 48-45 win over Iowa State while the Wildcats (5-1, 3-0) enter Saturday’s contest as the lone unbeaten team in Big 12 play. K State upset Oklahoma 31-30 on the road last week and vaulted to No. 11 in the AP Top 25. Kansas State’s only loss of the season came at home to Auburn. The Wildcats lost 20-14 but were in that game until the very end. Three missed field goals and three turnovers prevented K State from pulling off the upset. Last season, Texas knocked off Kansas State 31-21 at home behind a career day from Jonathan Gray. Gray rushed for 141 yards and two touchdowns on 28 carries in the win. 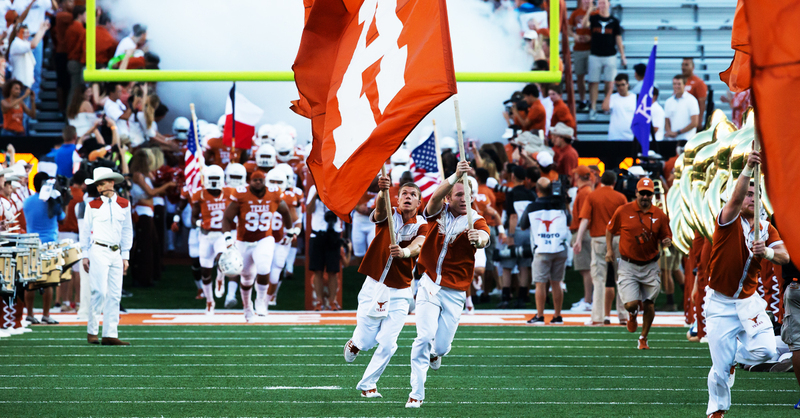 Overall, the Longhorns ran for 227 yards and were able to move down the field against the Wildcats early and often. Texas went up 17-0 late in the first half and forced a couple of late turnovers to halt K State’s comeback bid and secure the W.
There’s no doubt that sophomore quarterback Tyrone Swoopes has taken some big strides over the last two weeks. Swoopes has gone for back-to-back 300-yard passing games for the first time in his career. The Whitewright native followed up his career day against OU with another big performance in Saturday’s win over Iowa State. Swoopes became just the third player in UT history to throw for 300 yards and rush for 90 in the same game. Swoopes’s only turnover came early on, but it came in the red zone. The Longhorns were had mounted a seven play, 78-yard drive and pushed the ball to the Iowa State 8 yard line before Swoopes rolled out to his right and threw a pick while attempting to throw across his body. It was a bonehead play that showed that Swoopes still has some maturing to do as a quarterback. Despite that blunder, the sophomore was dominant throughout the contest. For the first time in his young career, Swoopes led Texas to victory and was the best player for the Longhorns. Against Kansas State, however, Swoopes will have his work cut out for him. The Wildcats rank second in the Big 12, allowing just 22.5 points per game. Considering they’ve already played against the high-powered offenses of Auburn and Oklahoma, that’s a pretty impressive stat. The Wildcats also rank third in the conference in total defense (in terms of yards) and allow a league-best 100 yards per game on the ground. The biggest knock on the K State defense has been its inability to create pressure on opposing quarterbacks. The Wildcats rank last in the Big 12 with only seven sacks in six games. The Texas offense needs to establish the running game early on to try to make Swoopes’s job easier, and if the offensive line can give Swoopes time in the pocket, hopefully the sophomore can build on his recent success with another strong performance. Texas needs to come close to replicating the big day on the ground it had last year in the win against Kansas State. If the combination of Swoopes, Jonathan Gray and Malcolm Brown can combine for around 175-200 yards on the ground, Texas will be able to control time of possession and give itself a good chance to pull off the upset. However, the ground game has been a problem for this Texas offense all season long. Brown and Gray averaged just under 4 yards a carry against Iowa State, and the Longhorns still rank second to last in the Big 12 in rushing. The inexperience on the Texas O-line has been a factor in this team’s offensive woes, and the boys in the trenches need to play the game of their lives on Saturday. The Wildcat defense features a couple of big-named players who could find themselves playing on Sundays. Senior DE/LB Ryan Mueller, a former walk-on, led the team with 18.5 tackles for loss and 11.5 sacks last season and was placed on the Bednarik Award watch list before the 2014 season began. While he hasn’t quite replicated his numbers of 2013 (2 sacks in six games), the senior still poses a big threat to wreak havoc in the Texas backfield. Junior cornerback Morgan Burns ranks second in the conference with three interceptions in only five games. On the other side of the secondary, junior Travis Green also has a couple of picks to his name. Senior linebacker Johnathan Truman leads the Wildcats with 60 tackles, ranking one spot behind Texas LB Jordan Hicks for third in tackles per game in the Big 12. For Texas to knock off Kansas State, the Longhorn offense has to take care of the ball and avoid penalties. It seems obvious, but turnovers and penalties have killed the Longhorns in each of their four losses this season. If the Horns can establish their running game early, the playaction pass over the top should come into play. Swoopes has been much more accurate throwing the ball in the last two games, and he’ll need to have a similar performance if he hopes to lead Texas to the upset on the road. It’ll take a total team effort, but if the Horns come anywhere close to the 48 points they put up against Iowa State, they have a chance to knock off the 11th ranked team in the nation.